Do you work at The Fish Club? What did you think of The Fish Club? 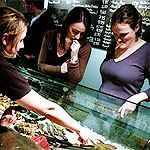 This upmarket reinvention of the Great British chippy caused quite a stir when it opened in summer 2004 by providing top-notch traditional (and modern) fish and seafood in cool, minimal surroundings at very fair prices. Neither the passage of time nor the opening of a second branch in nearby Clapham High Street seems to have done it any harm. When you are competing for custom with the countless restaurants and takeaways of smart-but-trendy St John’s Hill, you need to make a good first impression. At the Fish Club, customers walk into a large, open area lined with stools and counters at which to read the (provided) newspapers whilst waiting for a takeaway, or to casually eat in. Down the centre, a stream runs under a glass floor. Further back is a fishmonger’s counter where you can browse the day’s piscine delights. 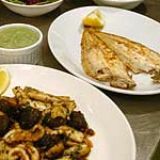 Do the plaice fillets or the whole Dover soles take your fancy? Are the mackerel or trout especially perky today? 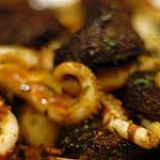 Do you fancy something a little more outre like skewered giant prawns and chorizo, or squid with black pudding? A blackboard on the wall, above a couple of dining tables, has the full list of options. Behind all this, a back room features two long trestle dining tables a la Wagamama, adorned with bottles of tomato ketchup and vinegar and metal containers of paper serviettes (well, it is still a chippy!). There is also the tiniest of patios where two small groups could dine al fresco. The young staff are friendly, casual and clearly proud of what they provide. There are many choices to make, so you may be glad of their guidance. Selecting a fish is hard enough, but do you want it battered and deep-fried, steamed or grilled? Chips, sweet potato chips or new potatoes with that? What about sauce: traditional tartare, aioli, sweet chilli or black bean? Once you’ve answered those tricky questions and more at the counter, find somewhere to sit. From then on, it’s a regular waiter-service experience. Your fellow diners are mainly well-heeled locals: this environment isn’t going to attract working-class septuagenarians looking for a mid-week OAPs’ special. The lighting is a tad harsh, and it probably isn’t the place for a first date (unless you want to impress by showing you’re a lateral-thinking fun guy or gal) but that’s okay: you’ve come for first-class fish, not for fancy napery and a tinkling piano in the corner. A starter of rocket and Parmesan salad (how very un-chippy!) is spot on. The portion is generous, the ratio of punchily-flavoured leaves to cheese just right, the dressing restrained and clean-tasting. Less successful is crab mascarpone. A dollop twice the size wouldn’t have gone amiss, and there is precious little crab flavour. It does, however, come on a slab of delicious, griddled, seeded bread which in turn sits on more rocket. Tuna steak turns out to be two steaks, and not particularly small ones, either. They are just cooked through, leaving them juicy and tasty. The little plastic pot of black bean sauce, as suggested by the waitress, is a perfect foil. A whole mackerel is faultlessly grilled, with succulent flesh and irresistibly crisp skin. A pot of salsa verde is another great match, herby and with sufficient citrus to offset the oily fish. A side of perfectly okay new potatoes is big enough for two. Crucially, chips are fat, fresh and faultless. Sweet potato chips sampled on a previous visit were equally good. Puddings are more mixed. A rhubarb brulee sounds delightful but disappoints, the custard texture being a bit mealy and the top insufficiently bruleed and therefore not crisp. Nice tart rhubarb, though. Better by far are scoops of chocolate, butterscotch and vanilla ice creams. There’s a great depth of chocolate flavour with crunchy little bits of chocolate running through, the butterscotch is flecked with caramelised sugar pieces and the vanilla provides a satisfyingly creamy counterpoint. A small selection of wines and beers is displayed, nestling in crushed ice, behind the counter next to the gaping fishy faces. The smart thing to do, though, is pay a £5 corkage charge and take advantage of the Bring Your Own policy. It is surely indicative of the sincere intent of this place that they miss out on those hefty wine mark-ups by allowing this. Soft drinks and still or sparkling bottled water are available at sensible prices and you can finish your meal with perfectly acceptable coffee. The Fish Club was a great idea waiting to happen. Why should fish and chips, surely one of the world’s great dishes, be confined to depressing, greasy cafes where the down-at-heel dine off well-worn plastic tablecloths? Several years on, many dishes are sublime, even if not all are perfectly realised, but when you can enjoy three courses for about £25 (if you BYO), what’s to complain about? My friend and I ate at Fish Club last night and loved it. We were greeted by friendly staff, the food was delicious and (not wanting to sound too like my mum) the place was clean and tidy and I was really impressed. The food may be a little more expensive then your usualy chippy but I thought it was well worth it. I throughly recommend you eat here. I certainly enjoyed the food and would love to return a million times until I have eaten my way through the entire menu! If you want fantastic fish and chips, or any other type of fish or shell food, then head to The Fish Club. The staff are fantastic, really friendly and helpful. The food is absolutely delicious and there is a great atmosphere. Try their sweet potato chips, or if you suffer from food envy like me, have half normal chips and half sweet potato. The Fish Club serves the best fish and chips in London. 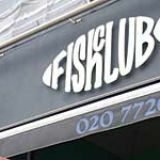 After watching a drab game of football at Brentford, my girlfriend and I had the hunger for fish and chips, and we certainly found the best place in The Fish Club. The staff were helpful and very friendly, it had a great ambience and, without doubt, the best fish I have ever had. The previous entry said "what is the point in the place even existing?". It's because, even though fish and chips are one of the most British things one can think of, why do they need to be drenched in fat and grease? Just like Hamburger Union, The Fish Club shows that good traditional fayre does not need to be thrown at you. It's a great place to eat, although a little pricey, the food and atmosphere was superb. Well done Fish Club, its a great Plaice to eat (Da dum dum, tush...). 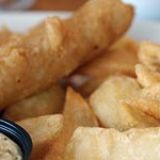 The Fish Club offers top fish and chips and great food in general. That's why it exists. What's the use in working class snobbery? The Fish Club is great! It's far superior to other greasy gaffs in the area. Fish Club is fine. However, I just don't see the point in it all. We have plenty of perfectly serviceable chippies without having to introduce these slightly more upmarket joints. Unless it's irony. That's probably it - classic, low budget Brit food in surroundings that simply scream "I'm rather swish daaaahling and not really British at all". Seriously, good as far as it goes but there's just no reason for it to even exist.